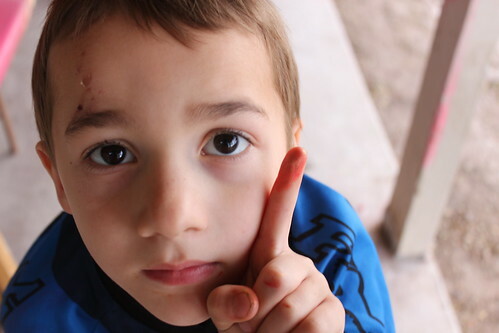 This is a photo of Ami showing his inky finger that was supposed to be included in yesterday’s post, but I pulled it for today’s, because I felt this story deserved to stand alone. See that scrape on Ami’s forehead? He had been spinning around on loose gravel, being a goofy boy earlier that day. He lost his footing and broke the subsequent fall with his face. That was Saturday. Fast forward to Tuesday, their first day back after the long weekend. I picked Ami up from school and his teacher asked me if it was true about the parrot. I thought she had confused me with someone else. She saw my bewilderment and informed me that my baby boy had told the whole class in earnest that he was attacked by a parrot at a petting zoo. When I asked Ami, fighting the giggles, why he made up such a story, he told me he couldn’t remember how he’d really done it. “So your first thought was a parrot attack?” I asked, no longer able to control my laughter. He shrugged and said, “Yeah” like it was the most natural conclusion. So I guess if I ever need to come up with a tall tale on the fly I can count on Ami to help me out. Your children are wonderful, creative and oh so funny! You are a lucky lady! I sure am! Thanks Kristen!